Every once in a while the Bar None Group takes a look at poetry in sports. Whether its a beatnik hockey commercial from a Bruin, a prognostication from The Greatest, a retirement notice from the Black Mamba or the wisdom of Metta World Peace. And with the latter we featured the former Ron Artest's own words poetically assembled by Jeff Parker. Parker's found poetry poem — Erratic Fire, Erratic Passion also serves as the title of his latest book. 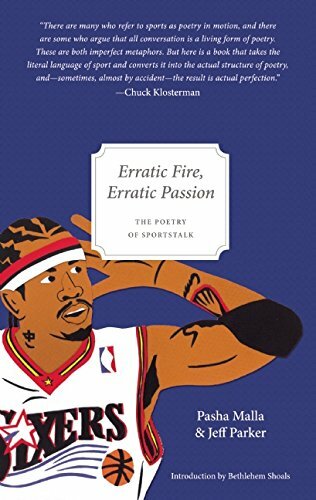 Erratic Fire, Erratic Passion is a collection of found poems composed of the words of professional athletes. Iconoclastic author Chuck Klosterman says, "There are many who refer to sports as poetry in motion, and there are some who argue that all conversation is a living form of poetry. These are both imperfect metaphors. But here is a book that takes the literal language of sports and converts it into the actual structure of poetry, and — sometimes, almost by accident — the result is actual perfection." The content of post-game interviews and sports chatter is so often meaningless, if not insufferable, and yet there are athletes like Metta World Peace who transcend lame clichés and rote patter, who use language in surprising ways, who can be funny and shocking and insightful and alarmingly sincere — pure poetry. This book is a celebration of these rare and exceptional moments. Various poetic forms and line-breaks highlight — or, in the words of Deion Sanders, “deem to set a candor on” — the sophisticated, sublime, and surprising performances of language made by professional athletes. Jeff Parker is the Co-Founder and Director of the DisQuiet International Literary Program, and the author of the novel Ovenman and the short story collection The Taste of Penny. He has taught at the University of Toronto and Eastern Michigan University, and currently he is the Director of the Low Residency MFA in Creative Writing at the University of Tampa. The book is co-authored by Pasha Malla, with illustrations by Nathan McKee and an introduction by sports writer Bethlehem Shoals. Jesse Harding Pomeroy's A Boston Brew of Tea Sir!